Whenever I see this Calycanthus floridus shrub it reminds me of my mother. This native American shrub blooms for a short period the first two weeks of May and it has a gentle sweet fragrance. Our mother often told me when this little shrub was in bloom she would pick one of those little flowers on her way to school and tuck it in her pocket to use as a fragrant sachet for the day. This deciduous shrub is very easily grown in this area and tolerates deer and has no real insects or diseases that attack it. This native shrub offers pretty yellow foliage in the fall. We have one on the property of The Rosemary House that is about 60 years old so I would say it is a long lived plant. Also called Carolina Allspice, 'round here we call it Sweet Shrub or sometimes simply, "shrub". Can't get a much more common common name then that! Mayapple is one of our first spring wildflowers. This native woodland plant produces early large leaves that the fairies use as an umbrella for the spring showers. Mayapple (Podophyllum peltatum) is one of the herbaceous members of the barberry family. It can colonize a large area by means of its underground rhizome. It occurs naturally throughout the eastern woodlands and is very easy to grow. It prefers a little sun and some evenly moist soil. However, mine grows in fairly dense shade and dry soil! You must look under the leaves to spot the flowers. When it is done blooming a fruit appears, the mayapple. It is the only part of the plant that is edible and I understand it is used for jellies and jams but I have never tried it myself. It's documented that the first European encounter with mayapple was in 1615 when the French explorer Samuel de Champlain encountered the plants being cultivated by the Huron Indians in modern day Canada. It is believed that the mayapples found in Canada today are there because of Indian cultivation after the last ice age! The Cherokees use the roots in traditional medicine but caution that only those portions of the rhizome between the nodes should be used, as the joints are poisonous. They use boiled root as a purgative, a drop of fresh root juice to cure deafness and powdered root to cure various ulcers and sores. In the 1970's it was discovered to be a cancer treatment, but the mayapples native to Asian countries have higher concentrations of the constituent used in the treatment. To make our fairy houses we use a variety of mechanics. Including wire and tacky glue. Hot glue doesn't hold up well out side so that is often a last resort. Another item we like to use is sand play dough. It holds up the sticks and the bark and provides a third hand while we are working. It also dries hard so you have a permanent structure. You can use it to make a sand castle also. Ingredients include: 1 C sand, 1/2 C corn starch, 1 t alum, 3/4 C water. To make add the sand, alum and corn starch in a sauce pan and mix completely. Add the water and stir until the corn starch is dissolved. Heat over medium heat, stirring occasionally. It will thicken in a minute or two. Once it cools down you can start sculpting with it. Use it up within a day or two. We are loving all the miniature gardens that are popping up. It was even a class in the Philadelphia Flower Show. Cute stepping stones and such a darling twig arbor. If I were a fairy I would move in here. Fairies love tea parties! Who doesn't right? These are some of the tea party vignettes at the Spoutwood Farm Fairie Festival. Colorful and flavorful where these little fairy cakes. Violet, Jasmine, Rose, and Cotton Candy. The Tea Party tent was strung with linen towels and hankies many of which had tea pots or tea cups on them. It was very pretty and very lacey. Posie Fairy greeting some of her tea party guests. One of our favorite events to attend and vend at happens in the beginning of May every year. 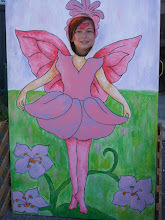 The Annual Spoutwood Farm Fairie Festival! It is 3 days of peace, love and music with lots of very creative fairies and fantasy characters thrown in. Here, Wedji Tucheeks is about to eat a mint plant. A very friendly goblin she put it down once I explained how to make tea with it. The King of the May and of the Sea, his Mer-Queen was beautiful as well. Some of the other sights around the festival. All ages, all genders, all shapes, all sizes, all styles participate in this event. It is really very creative. We are the herb plant vendor. Creeping Thyme is a favorite of the baby fairies, they like to lay down and take a nap in it. Four o'clocks are fairy clocks. Dill makes a lovely privacy fencing for the fairies. Petunias make the most beautiful skirts. The colorful yellow Daffodils and Narcissus are gone for this spring. It is always such a joy to see them when they are here. Alas, now we are left with the greens. It is a must to leave the green leaves on as that is what is nourishing the flower bulbs for the big show next spring. Do you tie the foliage? Or perhaps you braid the greens? I must say when they are tied or braided it makes for a much tidier flower bed. 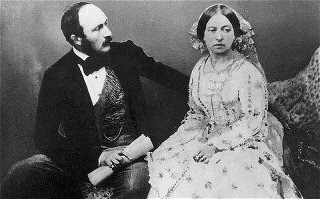 Ruth from Antiques and Teacups recently shared this great link to Victoria's Scrapbook. Tina Sams, editor of the Essential Herbal Magazine and the one in pink "photo bombing" Susanna, coordinated the publication of a new book on Elder. Written by six different women herbalists, this fun little book covers all aspects and uses of Elder, the Herb of the Year for 2013. Everything from growing to medicinal, to liqueurs and cordials, to candies, to syrup and on and on, elder in the kitchen or elder lore, it is all here in this 40 page book (or available as a down load too). 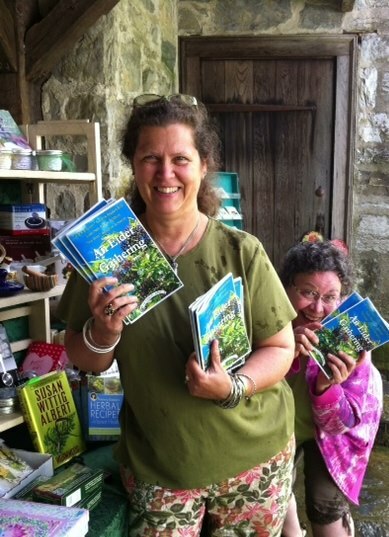 Tina Sams and Susanna often vend near each other at different herb festivals, to find them you just listen for the laughter! So a friendly competition was developing on who could sell more of this fabulous book. There are over 30 recipes, crafts and remedies in this book. Lots of fascinating folklore and quality photos to help you identify Elder. 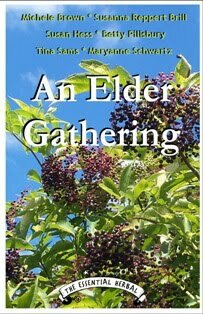 This six friends share all their favorite uses for elder flowers and elder berries in this well indexed book. Won't you join me? What shall we talk about today? Last week we enjoyed Afternoon Tea at The Tea Trolley in Delta, PA. This beautiful Victorian home is located near the PA/MD border. It provided a lovely respite for our traveling herb seminar. The lovely place settings featured assorted teacups and plates. Notice the napkin rolled into the teacup and the petite spoon tucked in the handle of the teacup. Clever. The hot pots of tea featured for the day included the House Blend (a traditional black variety), Almond Cookies, or a decaffeinated Raspberry tea. A generous fresh salad dressed with a strawberry dressing was presented as the first course. The three tiered tray service included chicken salad, egg salad, and carrot & cheddar cheese sandwiches. There were two of each variety for the guests. They were all very tasty and fresh. The top tier held the warm English cream scones. It was served with a sweet cream, lemon curd, and strawberry preserves. And the beautiful assortment of desserts included a tasty meringue, a petite fruit tart, a delicious chocolate truffle in an edible chocolate cup, and a tiny white cake with a sweet pink frosting. Oh yum! The perfect ending to a fun afternoon tea. Rachel Cox, the owner, greeted our group and shared a little history of the building. Additional photos from her photo gallery can be seen here on the tearoom website. Behind her is a tiny peek into the gift shop where you could purchase the teas that were served along with the lemon curd, and assorted fun tea related items. Sharing some whimsical displays of garden artistry that captured my eye recently. Love this little cat statuary holding a nest of eggs! Looks like a serene setting to enjoy a glass of iced tea! Did you spot the face and wild hair on this rusty shovel? Fun little garden discoveries while we were out and about on a rather unseasonably cold Monday in May. These two distinct, yet similar, tea themed wreaths were spotted in two different tea rooms. The one on the left has tea cups nestled about the wreath with a gold ribbon and berries running around the faux pine wreath. 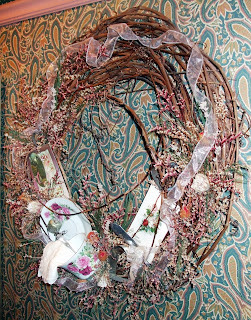 The wreath shown below is made with a grapevine base and features a delicate ribbon woven around the wreath with tea related trinkets tucked at the base of the wreath along with a pretty teacup and white gloves. Fun little discoveries during our tea room travels. Both of these wreaths would be fairly easy to replicate. Our annual Mother's Day Tea is now one for the memory books. The first course included individual cups with Herbed Spinach Dip and assorted fresh veggies. The sweet little cups are actually meant for baking cupcakes, but the pretty floral pattern and die cut edge caught my eye. I thought it might make a fun and different presentation for the starting course. This next photo shows the sandwich course, plated and ready to be served. The sandwiches included Pimiento Cheese on Pumpernickel tied with a garlic chive leaf, Roasted Red Pepper Hummus in a Phyllo Cup, a warm Boursin Cheese and Green Onion Stuffed Biscuit, Fresh Sweet Strawberry Bruschetta, an Apple, Rosemary and Blue Cheese Knot, and a Petite Phyllo Shell filled with Herbed Goat Cheese. Angelica starting to serve the Scones and Fruit. Our guests enjoyed Traditional English Cream Scones and White Chocolate Apricot Scones, always served fresh out of the oven. A sampling of fresh fruit and assorted scone toppings completed the plate. And the little trio of desserts featured an Italian Cream Cupcake, Coconut & Pecan topped Chocolate Cupcake, and a Tangy Lemon Filled Cookie. Just the right size! Angelica and her mother helped waitress. Angelica lamented that she wants to come to the Mother's Day Tea, with her Mother, but sadly, she realizes she is probably the tea server again next year. I suggested she try and make reservations next year. We'll see what happens with that idea. Hope everyone enjoyed a Happy Mother's Day!